Want to test your project on Bazel CI? Simply file a request via this link! 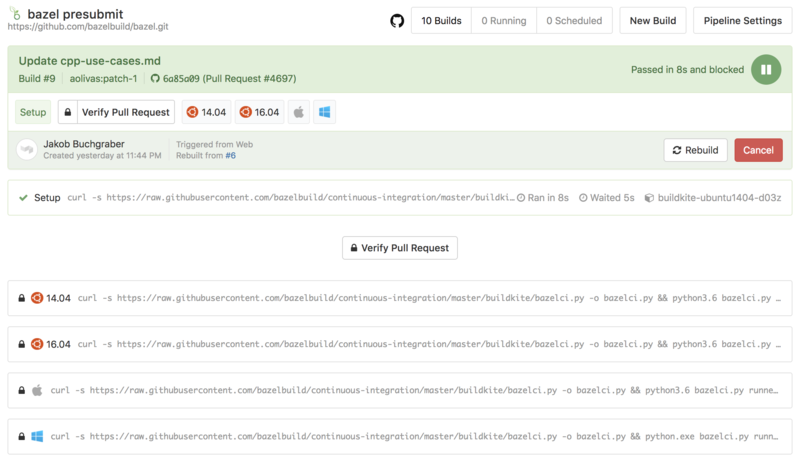 Bazel uses Buildkite for continuous integration. The user interface and the orchestration of CI builds is fully managed by Buildkite, but Bazel brings its own CI machines. The buildkite folder contains all the scripts and configuration files necessary to setup Bazel's CI on Buildkite. The bazel postsubmit pipeline builds and tests each commit to Bazel's repository on all supported platforms. The bazel presubmit pipeline is triggered on every pull request to Bazel. The rules_go postsubmit pipeline is triggered on every commit to the rules_go repository. The TensorFlow pipeline builds and tests TensorFlow at HEAD every four hours. When you click on a pipeline you can see the last few builds of this pipeline. Clicking on a build then gives you access to the details of the build. For example, the below image shows a failed build step on Ubuntu 16.04. One can see which tests failed by clicking on the Test section. In the below example, the //src/test/shell/bazel:external_path_test was flaky as it failed in 1 out of 5 runs. You can view the failed test attempt's test.log file in the Artifacts tab. Bazel accepts contributions via pull requests. Contributions by members of the bazelbuild organisation as well as members of individual repositories (i.e. rule maintainers) are whitelisted automatically and will immediately be built and tested on Buildkite. An external contribution, however, first needs to be verified by a project member and therefore will display a pending status named Verify Pull Request. A member can verify a pull request by clicking on Details, followed by Verify Pull Request. After a pull request has been built and tested, the results will be displayed as a status message on the pull request. A detailed view is available when clicking on the corresponding Details link. Click here for an example. You can preview the effect of an unmerged commit on downstream projects. See Testing Local Changes With All Downstream Projects. Bazel downstream projects is red? Use culprit finder to find out which bazel commit broke it! First you should check if the project is green with the latest Bazel release. If not, probably it's their commits that broke the CI. If a project is green with release Bazel but red with Bazel nightly, it means some Bazel commit broke it, then culprit finder can help! TASK_NAME (The task name must exist in the project's config file, eg. macos_latest). For old config syntax where platform name is essentially the task name, you can also set PLATFORM_NAME instead of TASK_NAME. Note: Bazel commit can only be set to commits after 63453bdbc6b05bd201375ee9e25b35010ae88aab, Culprit Finder needs to download Bazel at specific commit, but we didn't prebuild Bazel binaries before this commit. Each pipeline is configured via a Yaml file. This file either lives in $PROJECT_DIR/.bazelci/presubmit.yml (for presubmits) or in an arbitrary location whose path or URL is passed to the CI script (as configured in the Buildkite settings of the respective pipeline). Projects should store the postsubmit configuration in their own repository, but we keep some configurations for downstream projects in https://github.com/bazelbuild/continuous-integration/tree/master/buildkite/pipelines. The CI script can run arbitrary commands before building or testing. Simply add the batch_commands (Windows) or shell_commands field (all other platforms). The run_targets field contains a list of Bazel targets that should be run before building. The build_flags and test_flags fields contain lists of flags that should be used when building or testing (respectively). You can specify a display name in the name field. The resulting job will display this value and an emoji that represents the platform. The CI script still supports the legacy format, too. CI supports several magic version values such as latest, last_green and last_downstream_green. Please see the Bazelisk documentation for more details. We upgrade the CI machines to the latest version of Xcode shortly after it is released and this version will then be used as the default Xcode version. If required, you can specify a fixed Xcode version to test against in your pipeline config. Warning: We might have to run jobs that specify an explicit Xcode version on separate, slower machines, so we really advise you to not use this feature unless necessary. The general policy is to not specify a fixed Xcode version number, so that we can update the default version more easily and don't have to update every single CI configuration file out there. However, if you know that you need to test against multiple versions of Xcode or that newer versions frequently break you, you can use this feature. As a consequence, every future build for this pipeline will contain an additional "Buildifier" step that runs the latest version of Buildifier both in "lint" and "check" mode. Alternatively you can specify a particular Buildifier version such as "0.20.0".